This book is three novellas, connected through the board games from a rummage/indoor garage sale at the very beginning of the first novella. Baby Boomers Polly Nichols, Lindsay Wilson, and Gretchen Anderson may live worlds apart, but they have one common hobby – a penchant for board games. Polly’s serene Kentucky campground turns sinister when the manager is a VICTIM of murder. In New Zealand, Lindsay’s life is turned upside down when MIND GAMES and evidence drag her into a murder case – as a suspect. At the Kettle’s On Campground in Georgia, Gretchen matches wits with a murderous wordsmith intent on winning the latest game of SENTENCED. You’ll love the games, the characters, and the stories – and we promise, you won’t be BOARD to Death! To our readers: Our characters are Christians, just as the authors are who created them, so their lives and their stories reflect this viewpoint. We hope you enjoy our fun and unique stories. The first novella, Victim by Amy Barkman, is about Polly, who moves into a trailer park [more of a retirement community than a typical trailer park] in order to downsize and simplify her life. She’s friends with a number of the people there, including those who meet daily to play games in the community room. The problem? One of them turns up murdered. As the investigation continues, Polly realizes that Sheriff Steve, the younger brother of her best friend, has feelings for her. In high school, he was the annoying younger brother. But now, nearing retirement age, those three years don’t seem like such a big difference. The second novella, Mind Games by Debbie Roome, is set in New Zealand. It is the story of a game sold online by the people in the first book. Lindsay sells hard to find items and antiques. One of her regular customers, Sheridan, buys it and invites her over to play with his game group. The problem? The owner of shop next door turns up dead with cards from the game in his pocket. Will Lindsay or Sheridan be implicated? Or will they be able to find their way through the mine field of mind games and find love? The third novella, Sentenced by Tracy Ruckman, moves to Georgia where Gretchen is running a campground for a friend and up-and-coming chef Melvin looks to be the highlight of the trip. The problem? The head of the Sentenced gaming group is murdered and another one follows. Is Melvin’s past about to catch up with him? Or is there another suspect willing to take the life of another? When Tracy asked me if I’d consider influencing for this book, I looked at the Amazon page and read a couple reviews. One said “Encyclopedia Brown for adults.” Now, I can’t get my [loves-to-read] 10yo interested in Encyclopedia Brown, but just reading that made me happy. I didn’t solve any of the crimes before the characters did, and I was fine with that. The hints were there, but I was reading for pure enjoyment not to see if I could outwit the cops and characters. I’ll likely reread it, now that I know the answers, to see if there were any other hints I didn’t pick up on, kind of like watching Sixth Sense a second time, but I don’t know that it’ll become one of my annual rereads. I recommend it to those who like a light mystery and some romance, complete with happy endings. I promise you won’t be Board to Death ;). If you’re looking for more heavy duty suspense, this probably isn’t for you, but for a fun read, it certainly fits the bill. I look forward to the release of the next book in the Dangerous Games series. 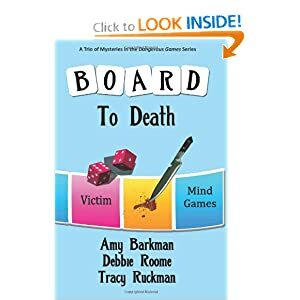 Thanks to Tracy and Write Integrity Press for an influencer copy of Board to Death. Thanks for the review, Carol! A fun read was our goal!